Detoxify and deeply cleanse your skin, with a combination of green clay, rosalina essential oil, macadamia oil, shea butter and tea tree essential oil. 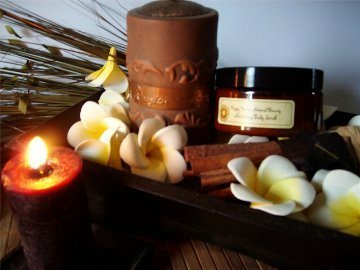 Promote radiant, firm, refined skin with this decadent weekly spa treat! A truly decadent cream clay mask perfect for oily, combination, mature and acne prone skin types - purifies, deeply cleans and refines the appearance of pores! Enjoy the clean, crisp, cooling sensation of these botanical ingredients on the skin in a fantastic weekly spa treat! Green Clay - a refining, detoxifying clay suitable for deep cleansing and revitalising the appearance of skin. Promotes skin elasticity, clarifies the skin, smooths the skins surface and refreshes. Shea Butter - gentle, yet deeply moisturising and protective, to maintain skins necessary moisture and smooth fine lines and wrinkles. Rosalina and Tea Tree Essential Oil - add a cleansing, refreshing feel to the mask, reduce the appearance of blemishes and purifty skin with mild anti-bacterial properties. These powerhouse ingredients create a velvety cream mask, easy to both apply and remove, well absorbed by the skin and wont clog pores. Apply a small amount (a flat teaspoonfull is more than ample) to clean, dry skin with fingertips, avoiding eyes. Leave to set for up to 15 minutes, then dampen down mask to soften and gently wipe with a wet towel or simply rinse away with water. Pat dry and moisturise with your choice of cream or serum.